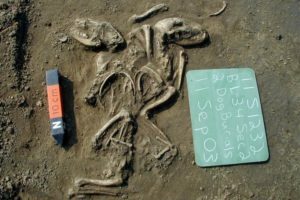 UNIVERSITY OF ILLINOIS AT URBANA-CHAMPAIGN—CHAMPAIGN, Ill. — A study reported in the journal Science offers an enhanced view of the origins and ultimate fate of the first dogs in the Americas. 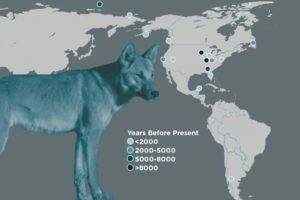 The dogs were not domesticated North American wolves, as some have speculated, but likely followed their human counterparts over a land bridge that once connected North Asia and the Americas, the study found. A ritual burial of two dogs at a site in Illinois near St. Louis suggests a special relationship between humans and dogs at this location and time (660 to 1350 years ago). 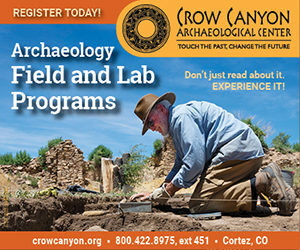 Photo courtesy Illinois State Archaeological Survey. 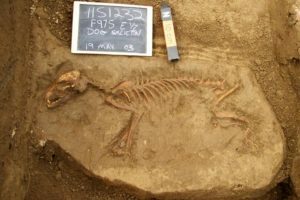 Ancient dog burials like this one found at the Janey B. Goode site near Brooklyn, Illinois, provided genetic material for a new study of dogs in the Americas. Photo courtesy Illinois State Archaeological Survey, Prairie Research Institute. Article Source: UNIVERSITY OF ILLINOIS AT URBANA-CHAMPAIGN news release.